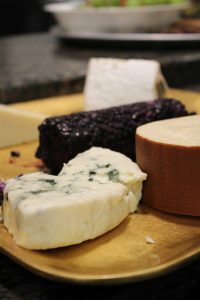 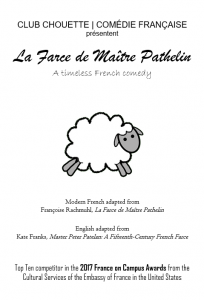 Maître Pathelin – A Rousing Success! 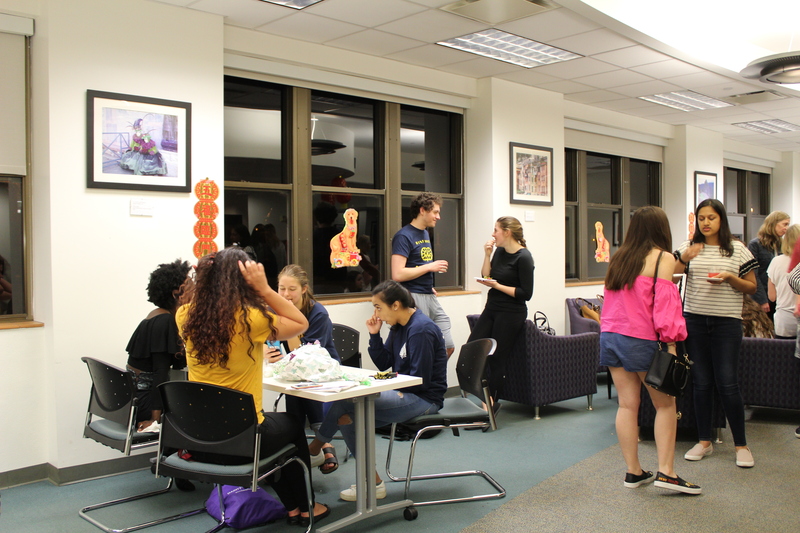 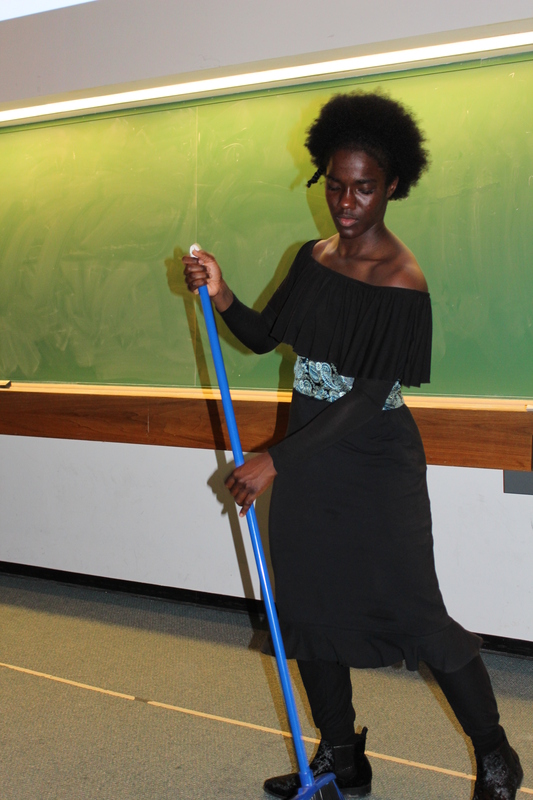 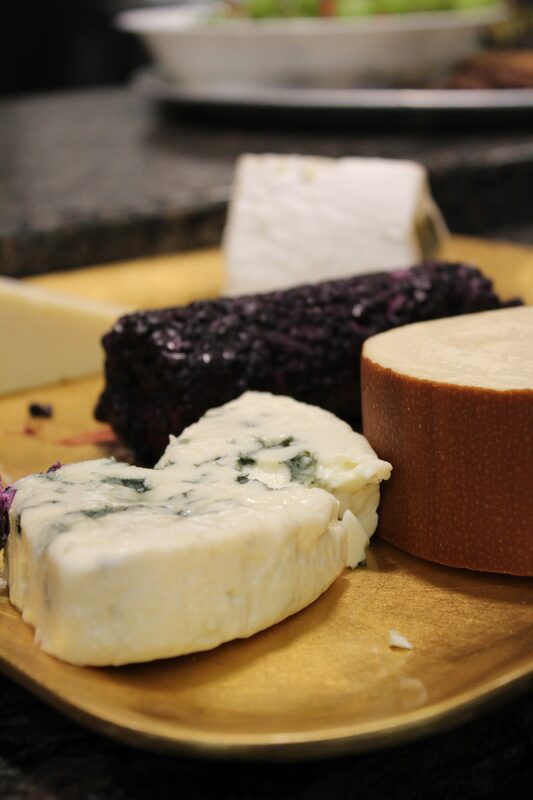 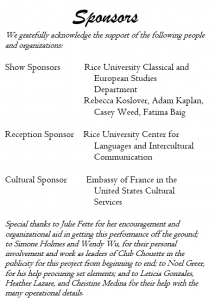 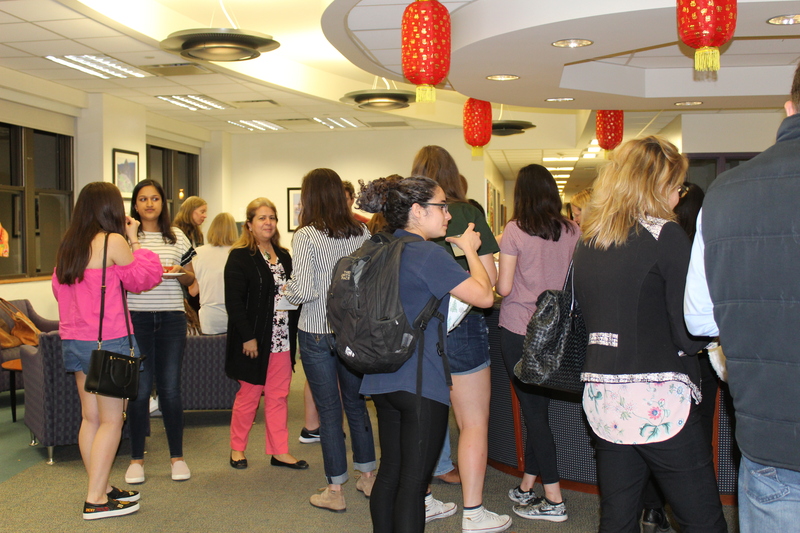 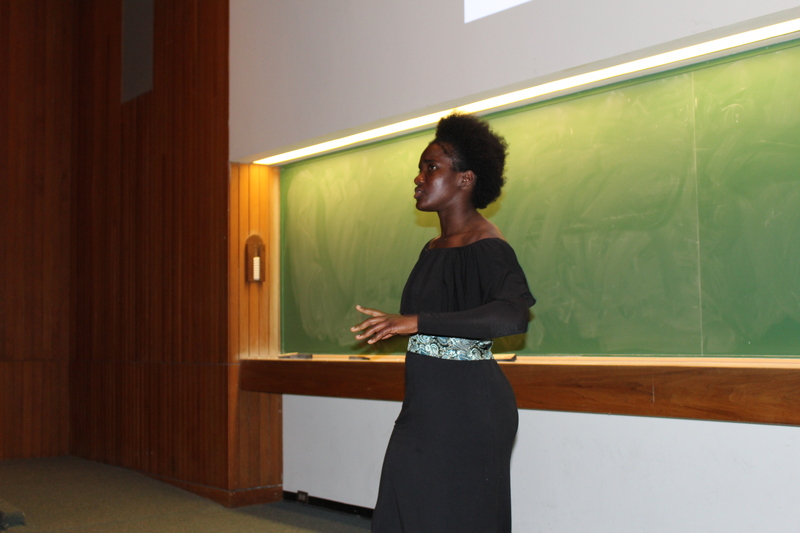 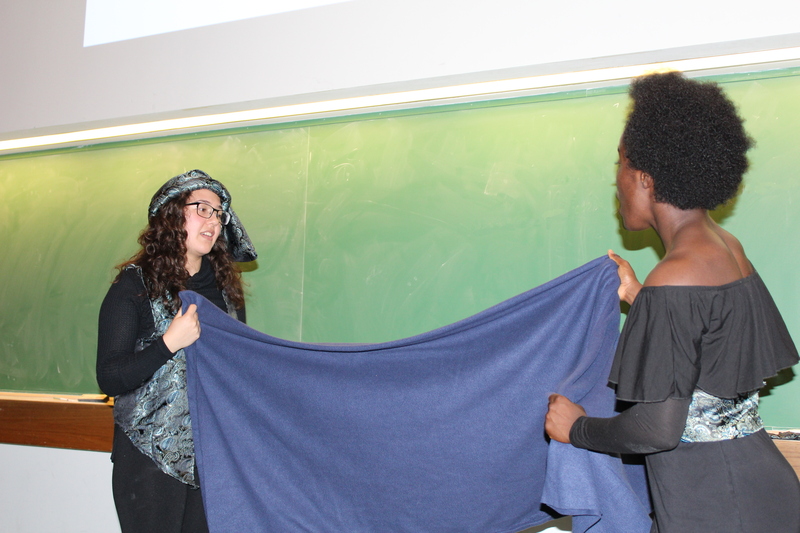 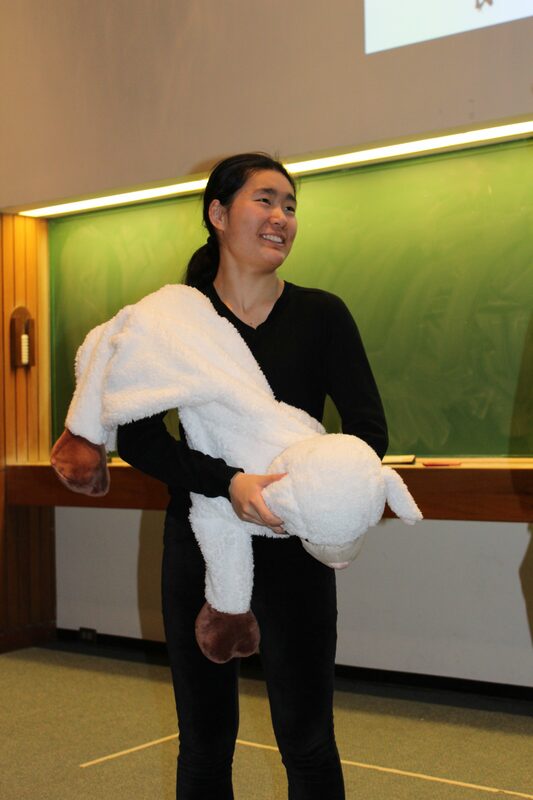 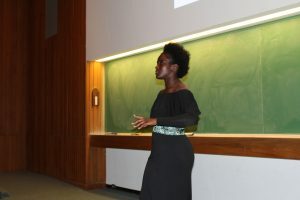 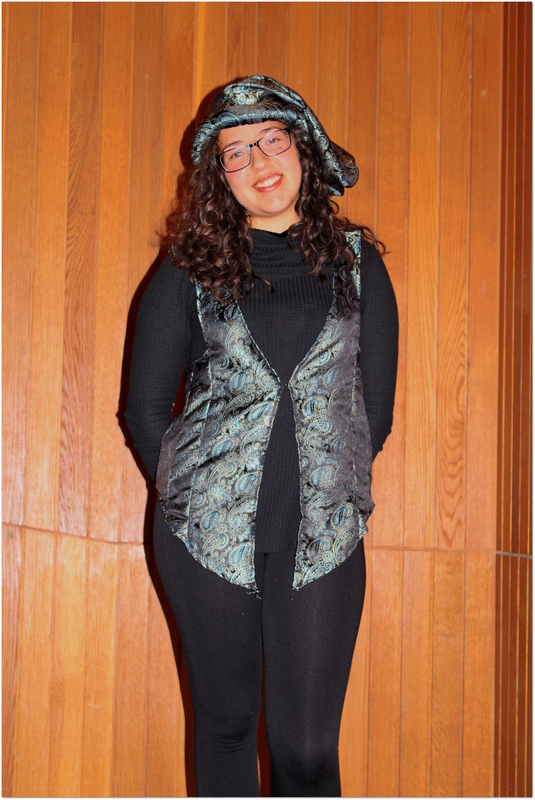 Maître Pathelin, which took place on the evening of March 2, 2018 at Rice University, was a rousing success, drawing a crowd of several dozen people from within the university community and beyond. For those of you who were unable to make it, here is a brief photographic narrative and summary of the play and the work leading up to it. 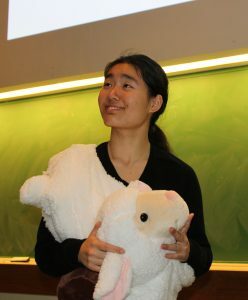 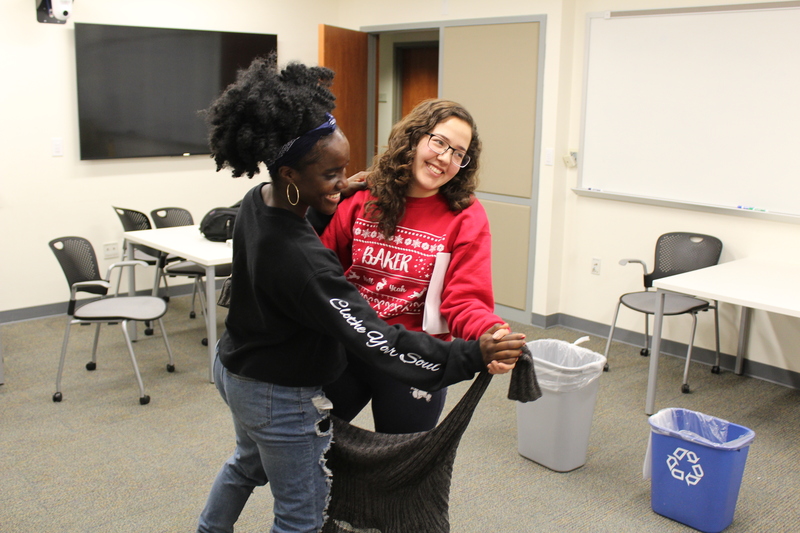 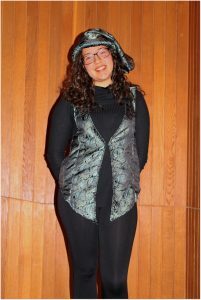 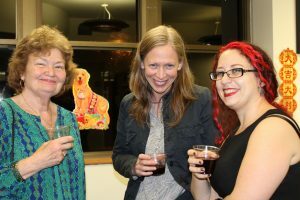 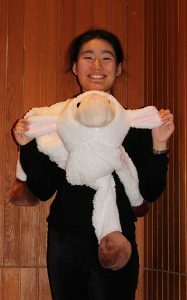 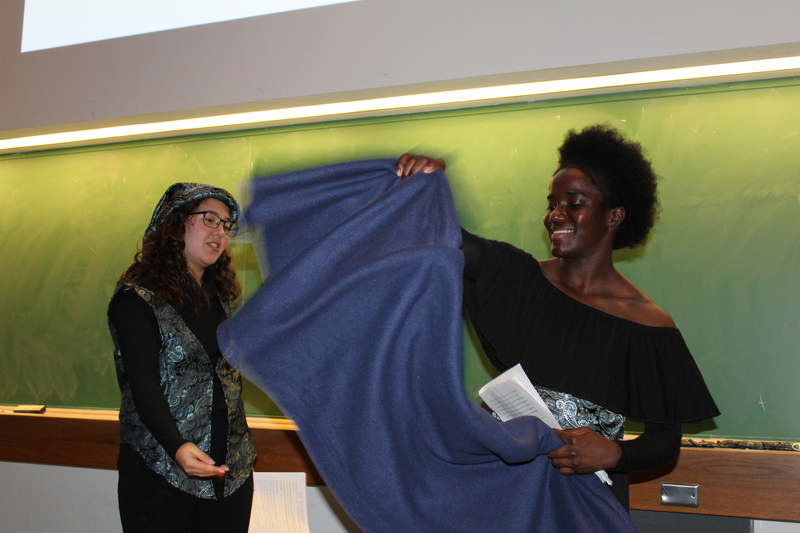 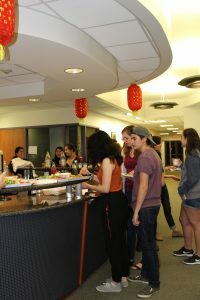 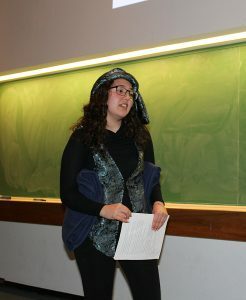 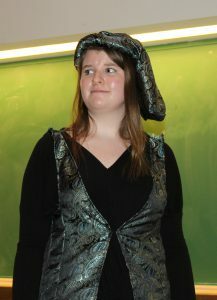 The project began with two cold readings held at the end of the fall semester and the beginning of the spring semester. 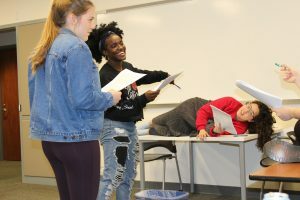 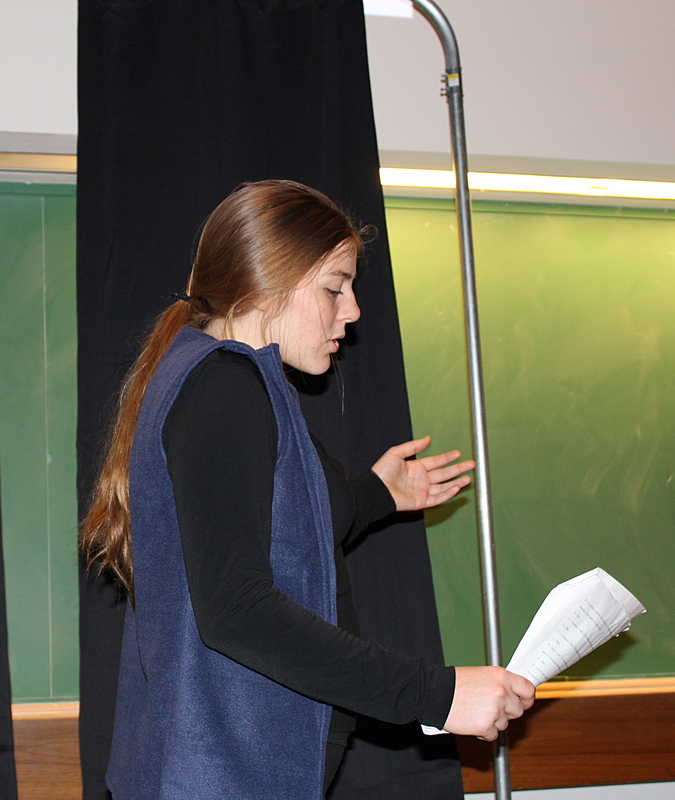 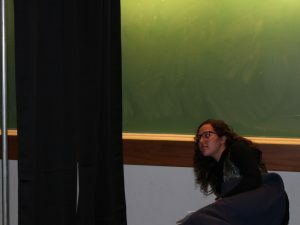 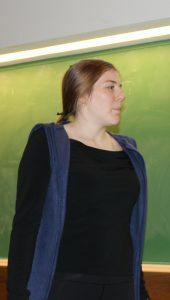 At these events, students read through cut scripts of both the anonymous Farce de Maître Pathelin and Le Jeu de l’amour et du hasard, by Marivaux. 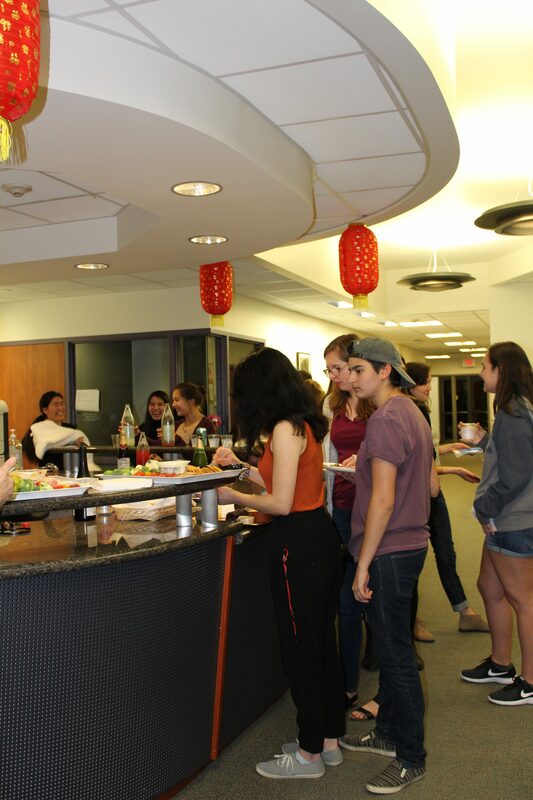 In the end, there were just enough interested, committed students to put on one show, so Maître Pathelin it was! Once that decision was made, the hard work began. 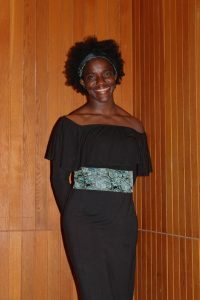 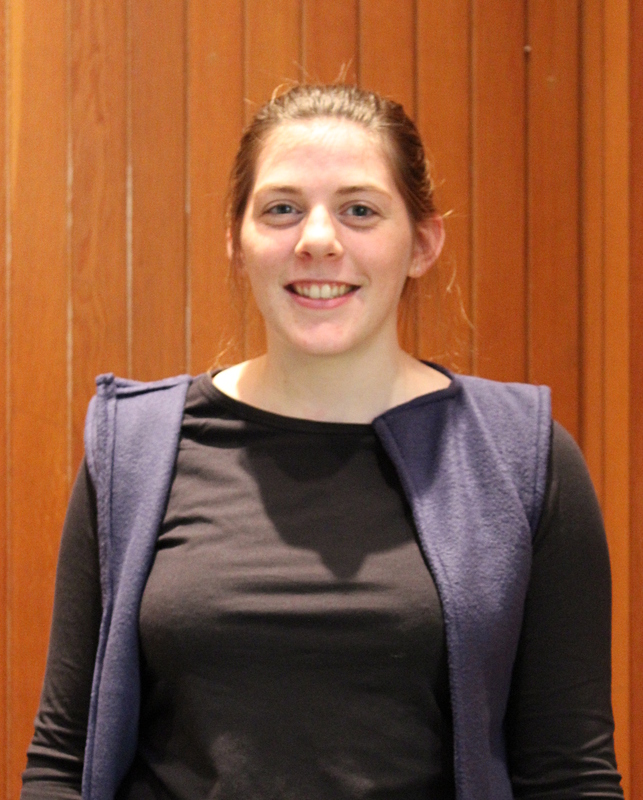 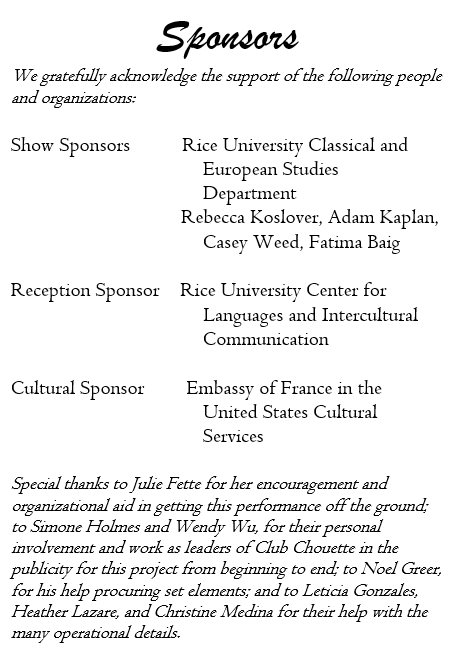 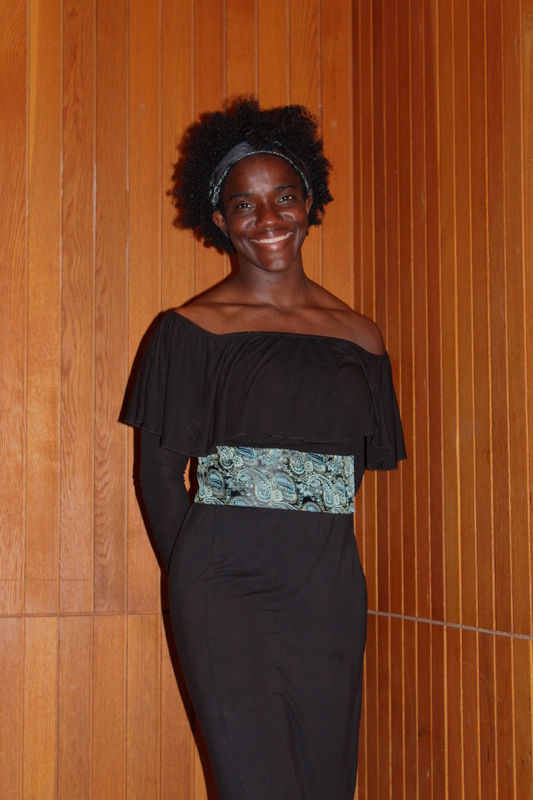 Simone Holmes, president of Club Chouette, put in a proposal for the 2017 France on Campus Awards, run by the Cultural Services of the Embassy of France in the United States, where it was classed among the top ten competitors. 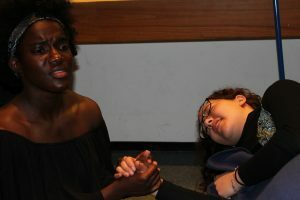 While Maître Pathelin did not receive any prize money, Simone had a meeting with a GoFundMe mentor, who provided advice on how best to set up a GoFundMe specific to the show. 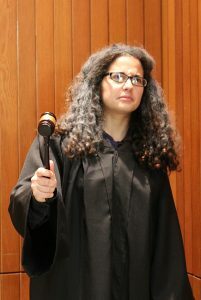 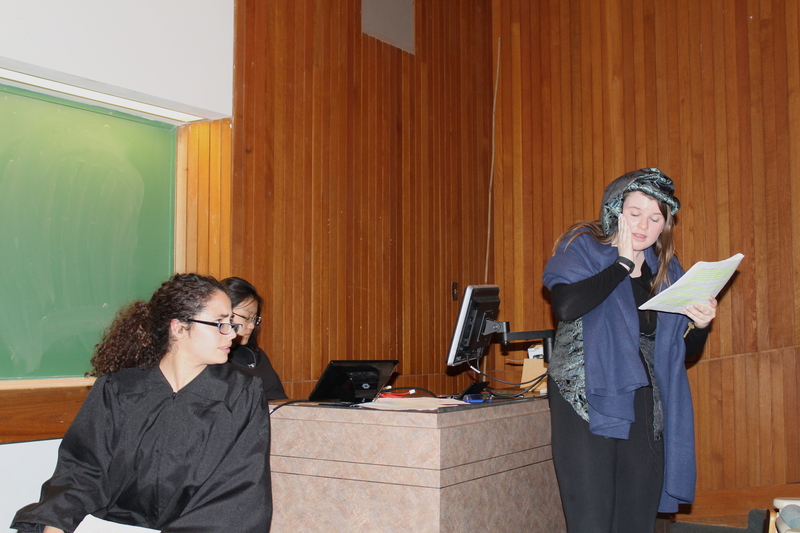 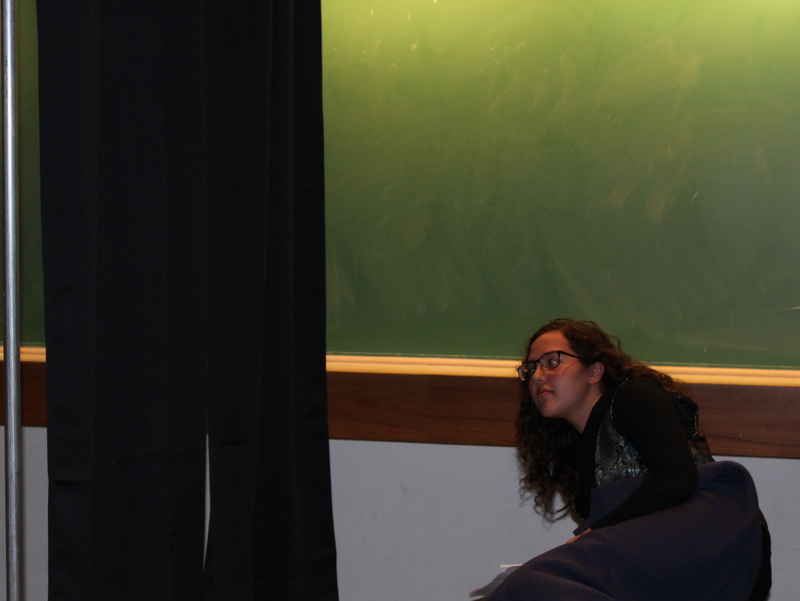 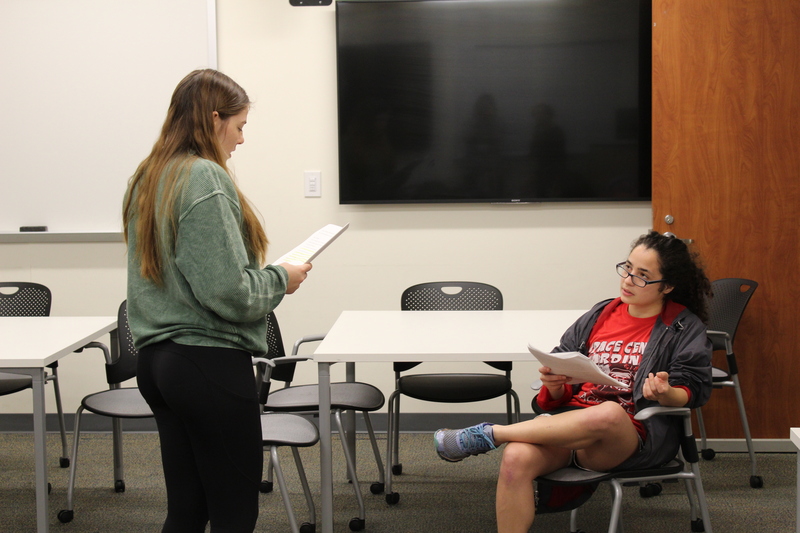 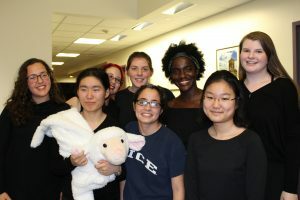 and The Judge (Sonia Hamer), began practicing in late January with a one-on-one read-through with the director (Dr. S.C. Kaplan), making sure they had a clear understanding of the meaning of their lines as well as of how each word should be pronounced. 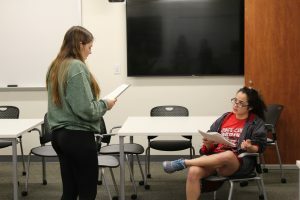 The following week, they had their first physical rehearsals, where they started figuring out where they should be when, and why. 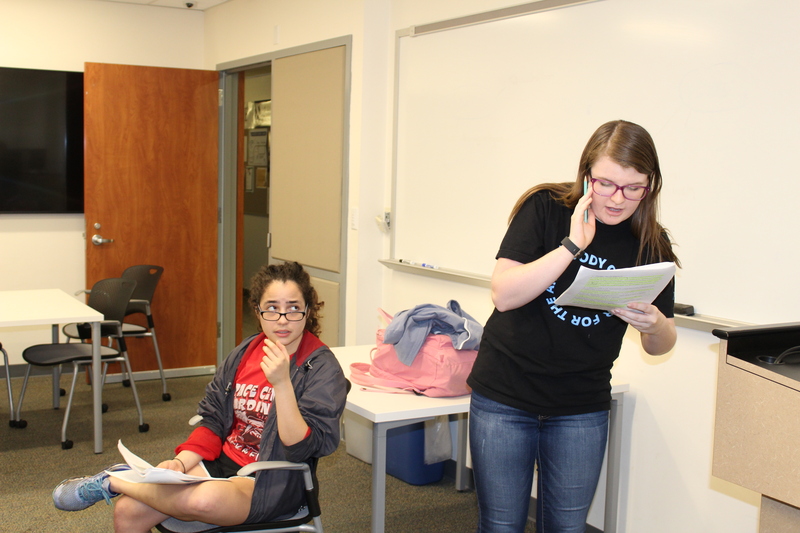 These early rehearsals led to a lot of laughter as everyone figureded out which gags worked best. 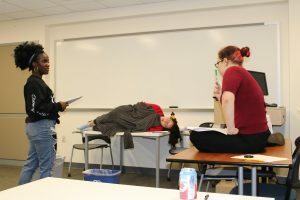 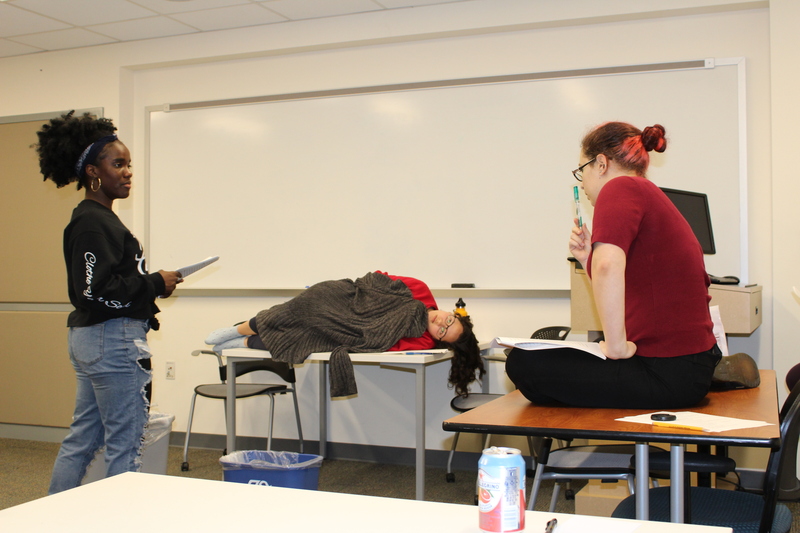 Early rehearsal of scene 2 with the director (Dr. S.C. Kaplan), Guillemette (Frelicia Tucker), and Pathelin (Diana de la Torre Pinedo, lying on the table). 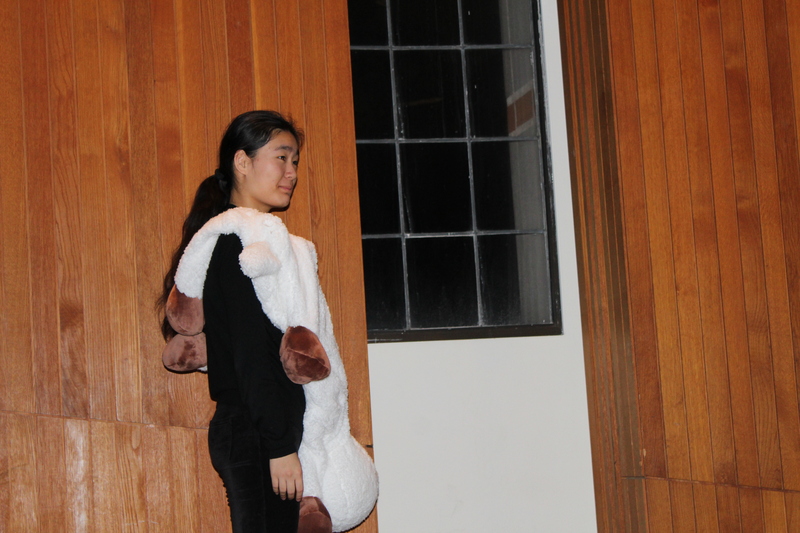 As rehearsals proceeded and the show got closer, props started trickling in–at a worringly slow pace. 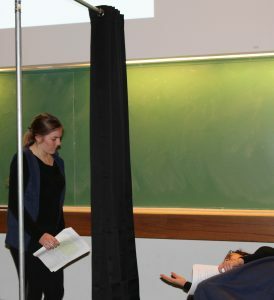 For a while there, it looked like pieces for the the single major scenic element would simply never arrive! 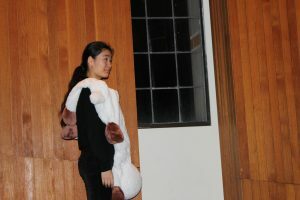 Fortunately, a local hardware store had what was needed so that dress rehearsal and the show could go on. 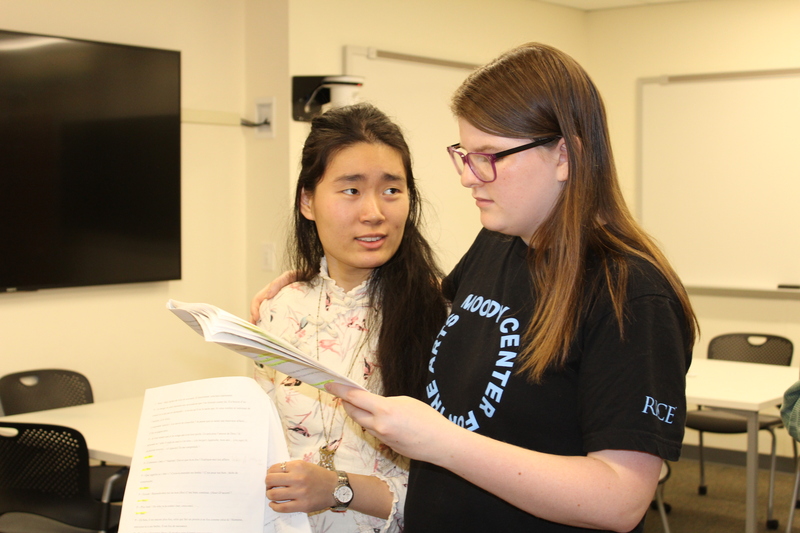 In the interim, the Assistant to the Director (DanBi Han) used a modern English translation of the play done by Kate Franks to start assembling the supertitles that would be projected throughout the show to make it more accessible to audiences of all levels of French comprehension. 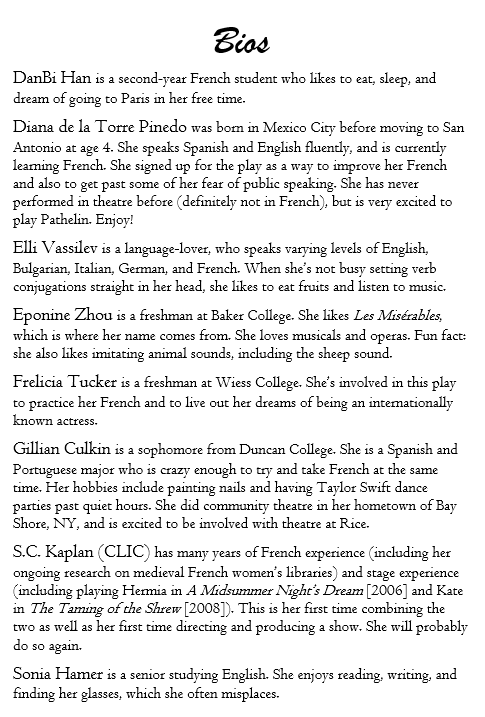 The show opened on Guillemette doing a little light housework while her husband, the eponymous Maître Pathelin (here Diana de la Torre Pinedo), is on his way home with a surprise. 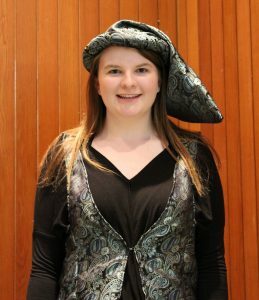 Although Guillemette is excited at the prospect of new cloth, she doesn’t trust her husband to have acquired it by honest means. 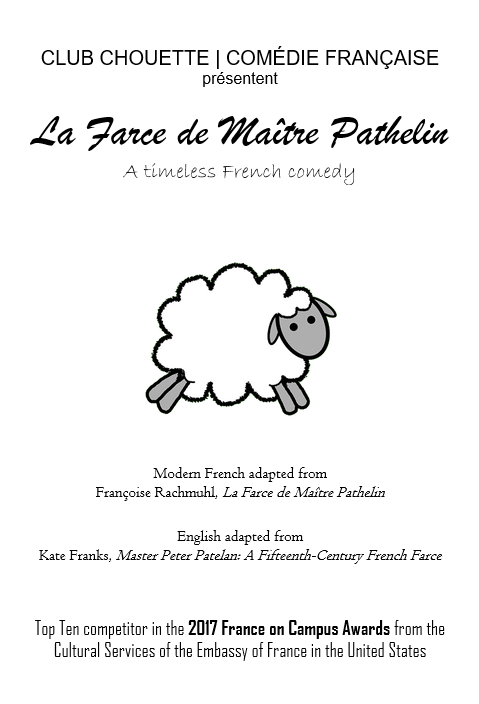 Fortunately, Pathelin has come up with a plan. 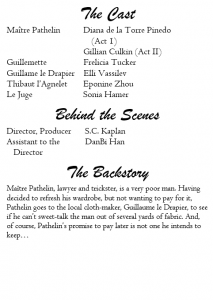 Once Guillaume le Drapier arrives demanding payment for the cloth that Pathelin took on credit, Guillemette plays the part of the distraught wife whose husband has been abed for weeks. 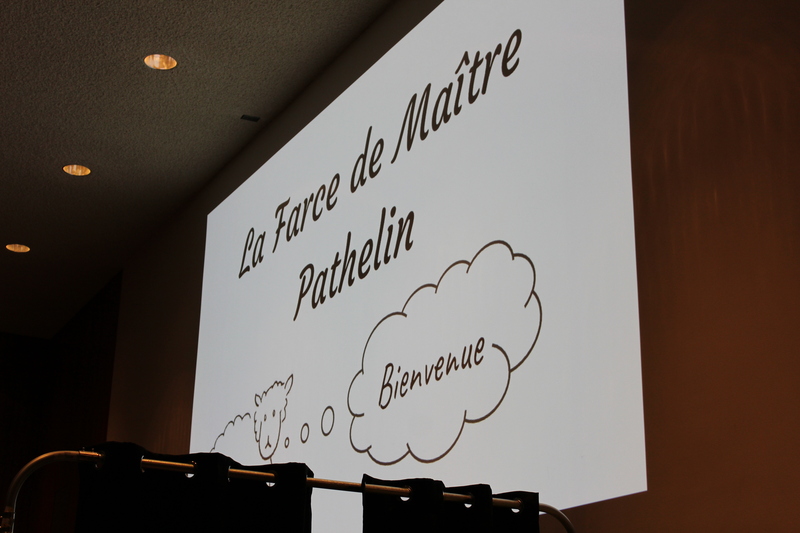 Pathelin, of course, keeps a keen ear on the proceedings. Pathelin dives fully into his role, calling desperately for care from his wife and confusing the cloth-maker for his doctor! 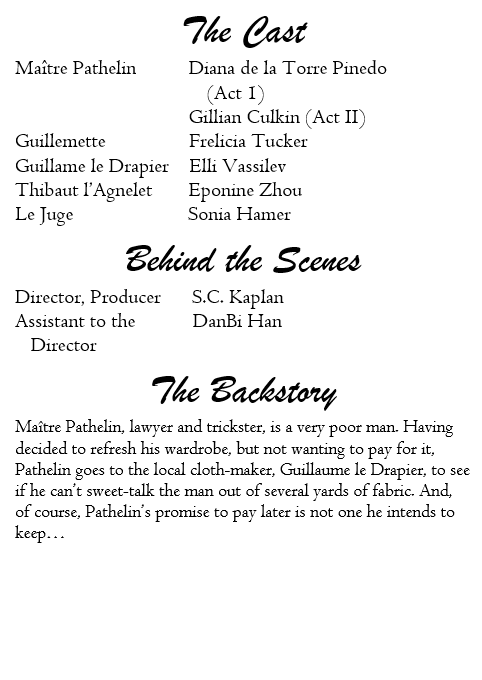 Pathelin and Guillemette are such a convincing pair that the cloth-maker eventually leaves confused and empty-handed, while husband and wife celebrate their success. 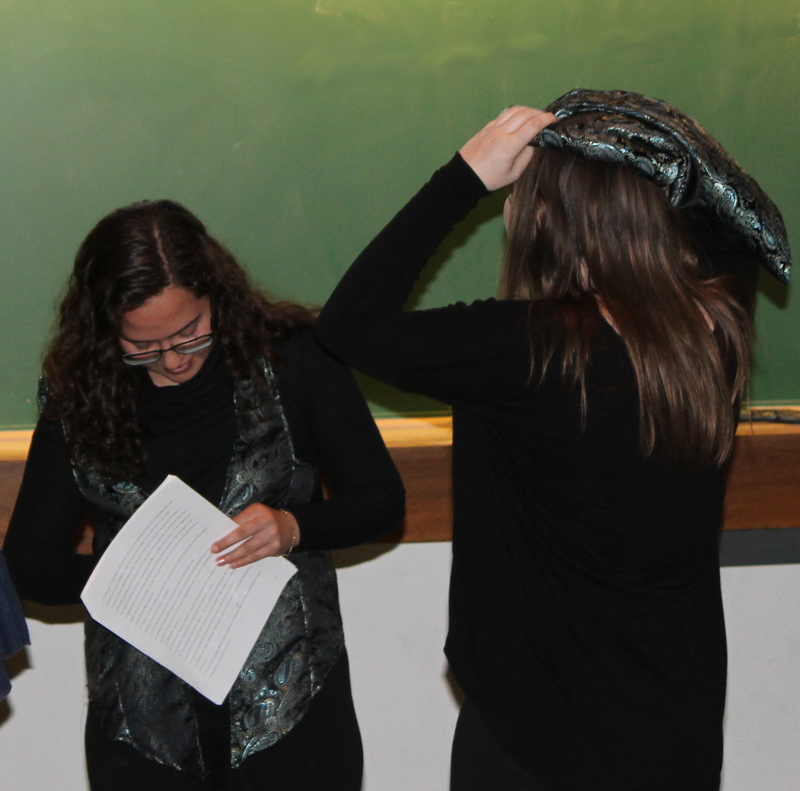 Between Acts I and II, hat and vest changed wearers and Thibault l’Agnelet arrives seeking aid. 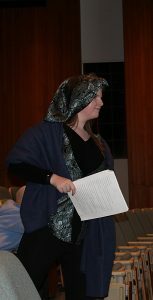 Once in court, however, Pathelin has to do some quick talking to convince the Judge that the Cloth-Maker is spouting nonsense. 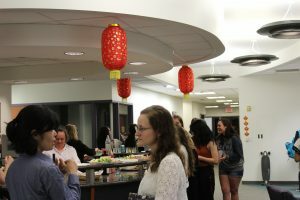 Afterwards, cast, crew, family, and friends all celebrated with a wine and cheese reception in Rayzor Hall. Thank you for joining us, and until next time!